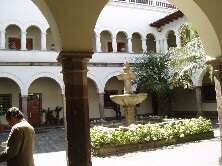 This photo was taken in the morning from our Hotel "Mercure Alameda Quito". Click on thumbnails below for 6 x 4 photos. I made arrangements to take a tour of "Old Town" Quito in the afternoon of the 20th. The guide and driver picked me up at the Hotel at 1:30 PM. 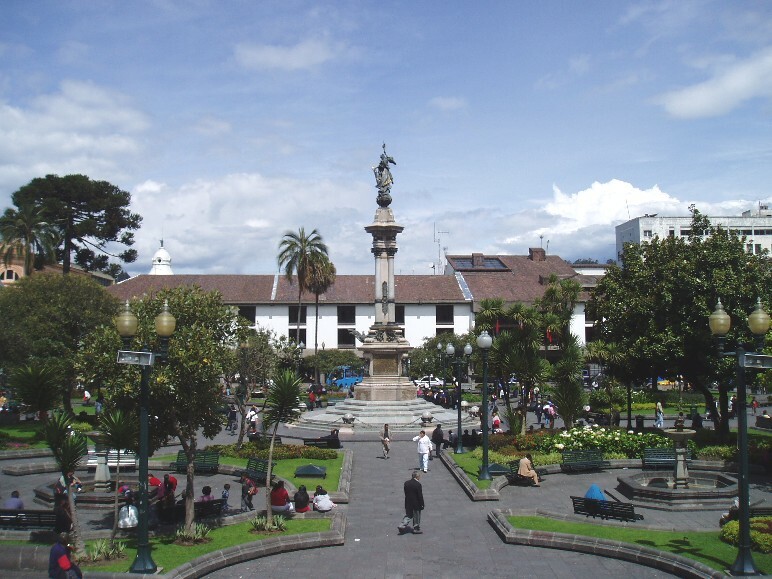 Quito is the second largest city in Ecuador, with a population of about 2 million. Guayaquil, on the western coast is the largest. 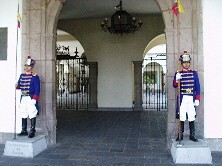 Quito, being the capital, contains the president's palace, museums, cathedral, etc. I also noticed enormous security on every block. Old Town Quito: It has an extension of 348 hectares. It is characterized by its high constructions of adobe, their facades, their narrow streets and the reddish roofing tiles of the ceilings. The old churches, colonial convents and houses that border their streets and squares, constitute a singular attractive. 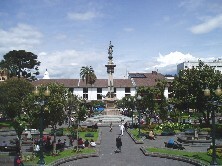 Plaza de la Independencia or Plaza Grande: It is the heart of Quito. 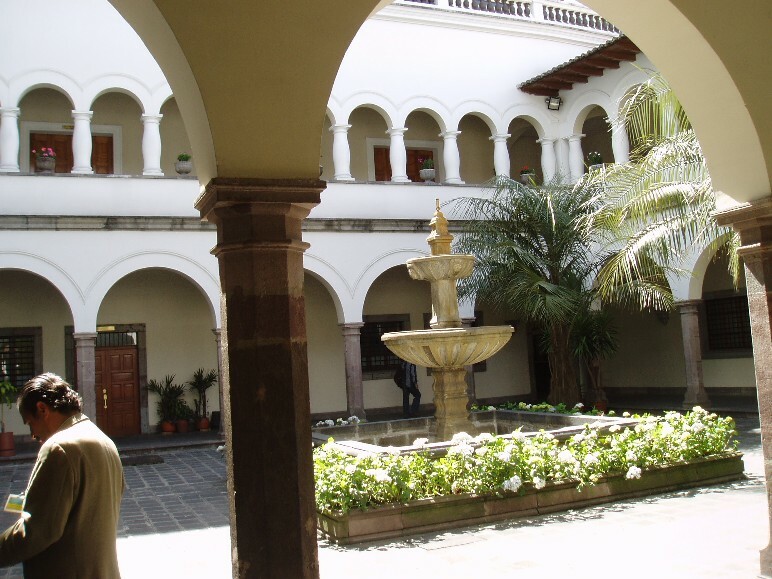 It is flanked by the Cathedral (constructed in 1565, it shows moriscas influences and it has a great amount of paintings and artistic works made by the best exponents of the School of Quito), the Palace of Government. In one of its inner patios the mural of the famous Guayasamín (that represents the discovery of the Amazon river) can be appreciated, the Archiepiscopal Palace and the building of the Urban Administration. 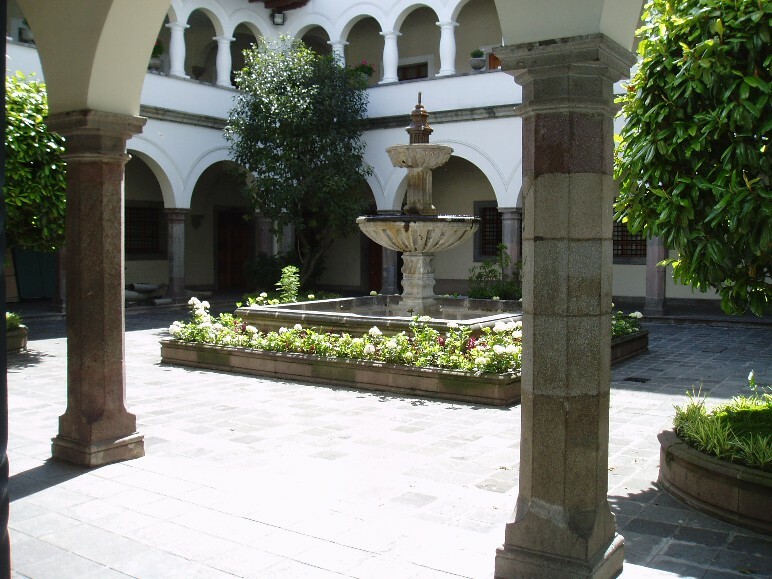 Plaza de San Francisco: This architectonic complex - that honors santo patron of Quito - is constituted by a church and a monastery. Its construction - on the rests of an inca palace - was directed by the flamenco missionary Jodocko Ricke. The works began 50 days after the foundation of the city (1534), reason why is considered the oldest of the continent. The complex has 104 doric columns. It emphasizes the scenery with images of the sun (the Inca God) that is seen in the ceiling of the church. One of its most valuable jewels is the panel of the Immaculate Virgin of Quito (the only winged virgin of the world), work of the painter Bernardine de Legarda. The Basilica: Blessed by the Pope Juan Pablo II, the 30 January 1985, this impressive Basilica, was constructed like a perpetual monument of the Consecration from Ecuador to the Heart of Jesus. 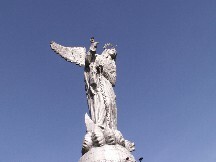 The idea to build it, was promoted by father Julio Matovelle in 1883. The first stone was placed the 10 July 1892. Mirador de Panecillo: A good alternative to acknowledge the dimensions and the layout of the old city. The Panecillo hill - that at the inca's time was a temple of adoration to the Sun God Yavirac- has on its peak a gigantic image of the Virgin of the Americas. Mitad del Mundo: 15 kilometers from Quito, there it is this small city, that owes its name to the fact that it's found at latitude 0°, a commemorative monument of 30 meters of height has been built. At its top, there is a 5 ton globe. One of the attractions and mysteries of the city Mitad del Mundo, is that during the equinoxes (21st of March and 21st of September) people and objects do not project not even the minimum shade. Many historical happenings took place on this natural hill that stands in Quito. "Panecillo" means "little bread" referring to its peculiar size and shape. The Virgin that stands on the hill, which consists of 7,000 pieces of aluminum, is a modern representation of the famous "Virgen de Quito", the unique winged dancing Virgin conceived by Bernardo Legarda in the XVIIth century. (The original masterpiece can be seen at the main altar of the San Francisco Church). 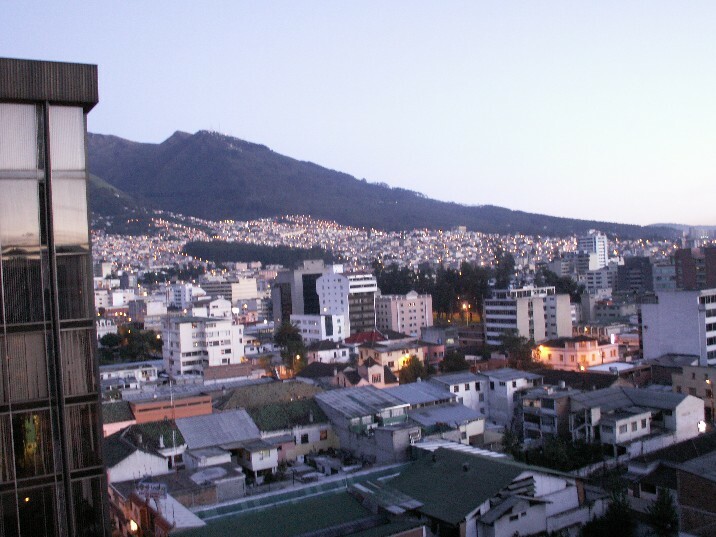 There is a balcony in the upper part of the pedestal of the Virgin that provides a beautiful view of the colonial and the modern city of Quito. This sculpture is the third biggest of the sightseeing statues in the world, after the NY Statue of Liberty and the Corcovada in Brazil.